Dehydrating is the most expensive way to preserve eggs, but only because the initial investment of a dehydrator will be anywhere from $65 to $175. We own three dehydrating machines now. We upgraded with each purchase, and have not been unhappy with any of the NESCO machines that we own. Having three functioning machines makes putting up the garden, barnyard, apothecary, and foraged harvest a lot quicker alone and when canning on the stove as well. When compared to the cost of buying long-term storage powdered eggs, a dehydrator is actually quite a bargain. Depending upon the brand of powdered eggs purchased, they can range between $11 for as many ounces to $15 for a five pound bag. The process for dehydrating eggs commercially is a lot more involved than drying with a residential machine on your own kitchen counter. Commercially, a spray drying technique is often used to liquify the pasteurized eggs. They are then sent through a spray nozzle type device into a heated tank. Once inside the tank the water evaporates and the solid egg powder collects at the bottom of a containment tank. When you compare home dehydrated eggs and commercially dried and powdered ones, you will likely notice a difference in color. This change in hue is caused by a de-sugaring process at the manufacturing plant that is conducted to help maintain both the appearance, and supposedly the quality of the egg during the preservation process. There are two ways to dehydrate eggs at home, the wet-dry method, and the cook-dry method. In the cook-dry egg preservation method, the eggs are scrambled first, without adding any milk or water, and then dehydrated for about 4 hours on 145F (62 C) heat until they become brittle. A mesh dehydrator tray liner must be used to prevent the drying eggs from falling through the slits in the machine trays. A solid plastic tray liner can be used, as well, but is not typically necessary since you are dealing with a solid food item. 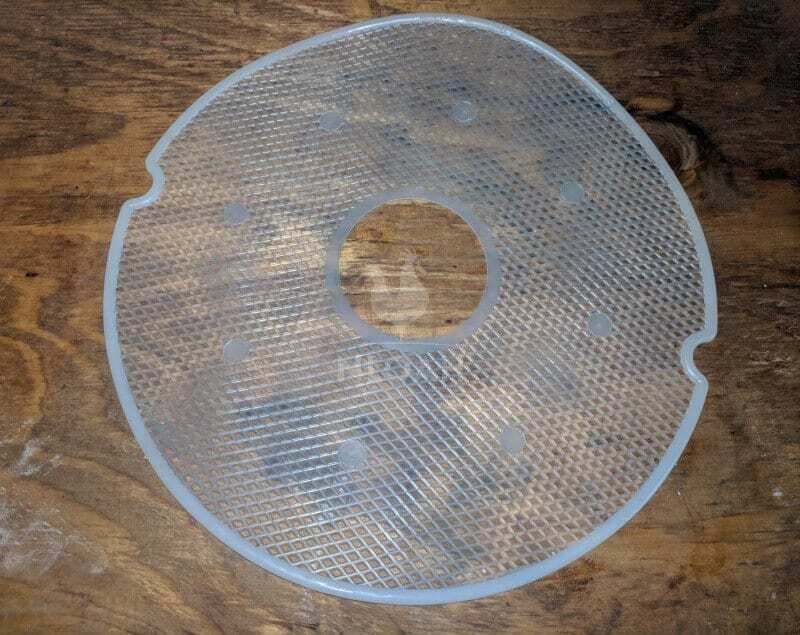 Most dehydrator machines come with a couple of mesh tray liners, but not always. If you do not have a machine, and are browsing models online or in a store, read what is included inside the box carefully. There is almost always an insert in the box or included in the instruction manual directing you to a website to order both mesh and solid tray liners. Amazon also sells the insert for all machine models the online store carries. I only tried the cook-dry egg preservation method one time. The eggs turned out great, but I felt the added step was not necessarily from either a quality or longevity standpoint, and the smell of the cooking eggs without the benefit of milk and water, as well as a more pungent scent during the dehydration process, were not pleasant ones. 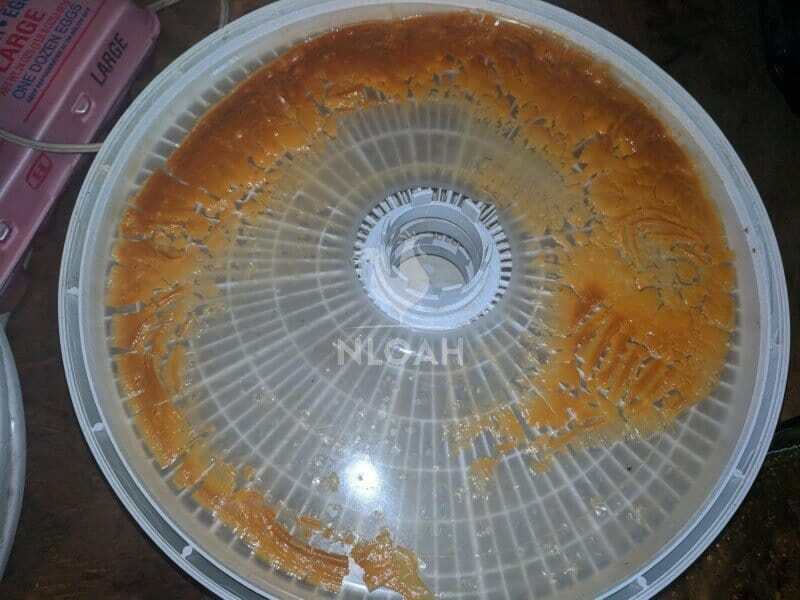 This is how a dehydrator tray that is not sitting level after being filled with beaten eggs (from either the wet-dry or cook-dry method) looks. 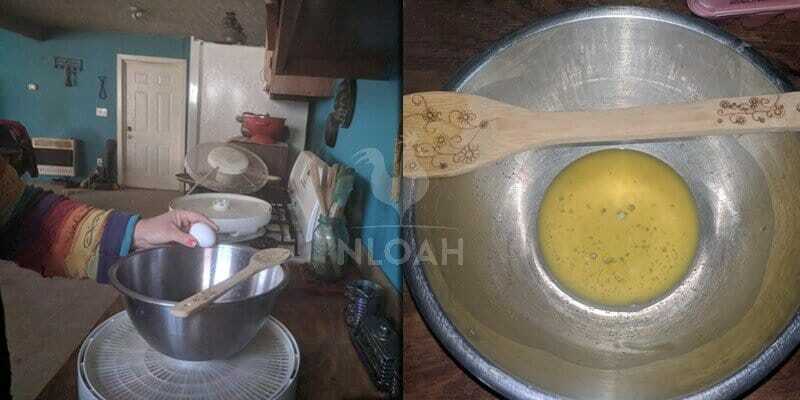 If left in this position, the eggs will not dry evenly, and in the same amount of time. 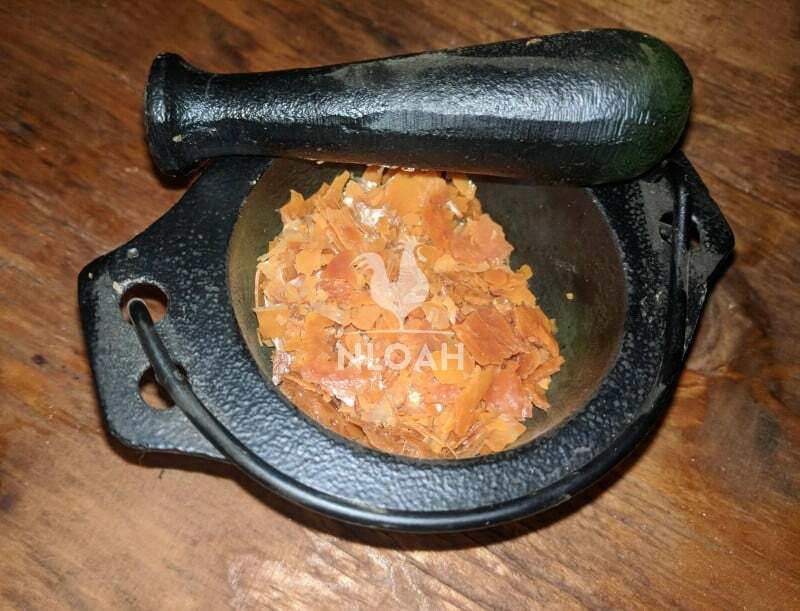 This method is very similar to the cook-dry method, with the stove top scrambling omitted, and a long drying time required. The beaten raw eggs are dried at the same 145F / 62C (or up to 160F / 71C if your dehydrator machine is capable) for 10 to 12 hours. 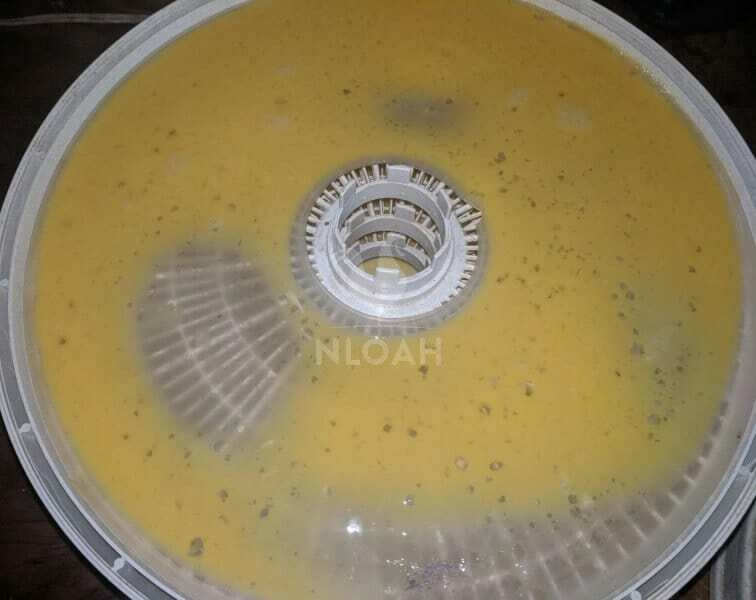 A solid plastic tray liner must be placed in the machine to hold the beaten raw eggs. It’s essential that the machine be placed on a firm and level surface, or the liquid eggs, despite their thickness, will pool at one end, or possibly pour out over the liner and down onto other trays – causing them to overflow too. Once the dehydrated eggs resemble thin peanut brittle and are solid (albeit somewhat oily) to the touch, they are done. 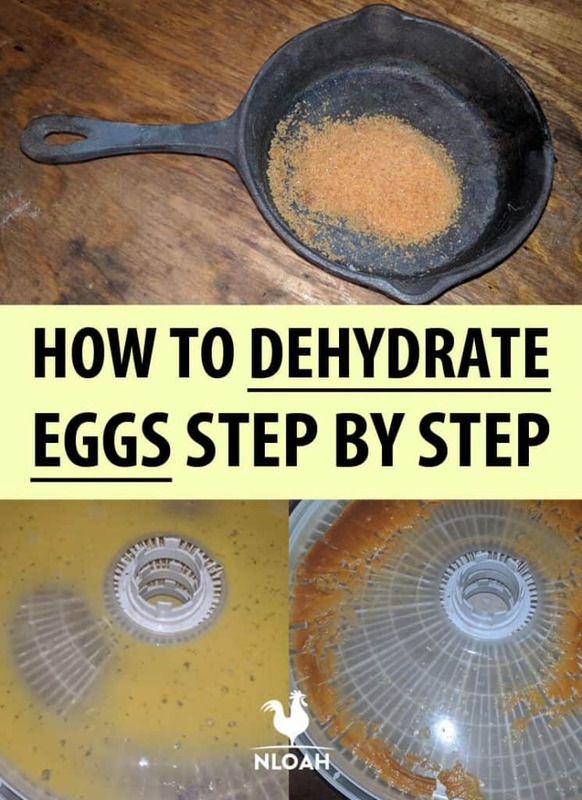 Dehydrated eggs that are done drying. If you see some dark patches it means you left them in just a little bit too long. The slight darkening does not impact either the preservation nor the taste. 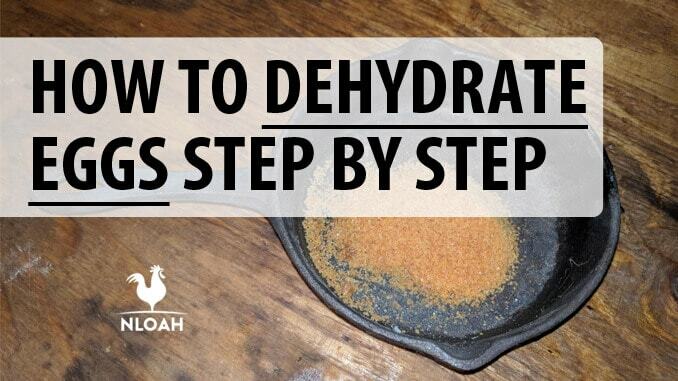 You can store the dehydrated eggs in simple thin chunks, or blend them into a powder. I prefer to powder the eggs because they take up less space to store and are far easier to measure when they need reconstitute – re-hydrated. No matter if you choose the cook-dry method or the wet-dry method, the eggs must be stored in an airtight container in a cool, dry place to ensure they remain shelf stable. I recommend storing them in small Mason jars to limit the number of times the preserved eggs are exposed to air and moisture when the lid is removed. Every time the dehydrated eggs are unsealed, their shelf life decreases by leaps and pounds. If you have a vacuum sealer machine, you can use the bags that come with it to store various amounts of preserved powdered eggs that you intend to use all at once, or use the Mason jar lid sealer attachment to vacuum seal the lids more tightly onto the glass container. When dehydrated and stored properly, farm eggs can be shelf stable for at least one year on a low end estimate up to 10 years. One tablespoon of powdered eggs equals approximately one large egg. I usually spread a mixture of about six large brown eggs onto each plastic dehydrator tray liner. It takes about 30 eggs to make four cups of dehydrated powdered eggs. To reconstitute the dehydrated eggs, mix them at a 2 to 1 ratio of powdered eggs to water or 1 tablespoon of eggs to 1 teaspoon of water. I always use lukewarm water to reconstitute eggs, it seems to work best. 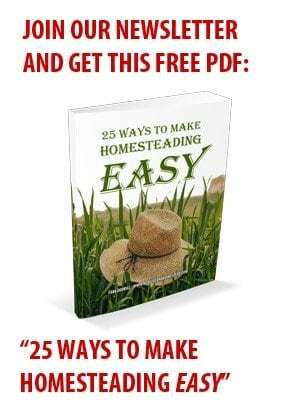 Some homesteading pals have used milk to reconstitute eggs for scrambling because they maintain their taste better. I tried using milk twice, and had horrible texture and tasting results. You can separate the yolks from the whites before blending the eggs together if stockpiling separated eggs for baking and cooking is a priority. If you are too concerned about potential salmonella poisoning caused by dehydrating eggs around 145F / 62 F, you can also spread the blended mixture onto a cookie sheet and dry them in an oven at 165F / 73C (if you oven goes that low) for 10 hours. The one time I tried this method I was able to spread a mixture of 18 large brown eggs onto the three baking sheets that would fit into my oven.